​Clifton was born in 1897 and lived at 6, Simms Cottages, The Holt. The 1911 Census shows him living with father, John, a broach (watch-tool) maker, mother Kate and brothers William and Clarence and sisters Evelyn and Doris. By the time he enlisted in 1916, the family had moved to “Evelyn House”, Warrington Road (named after his sister). His occupation was also that of a broach (watch-tool) maker. He was hospitalised whilst in France following an injury to his knee in July 1917 but returned to his unit in August that year. Records show that he was transferred to the Royal Engineers in February 1918 and demobbed in February 1919. 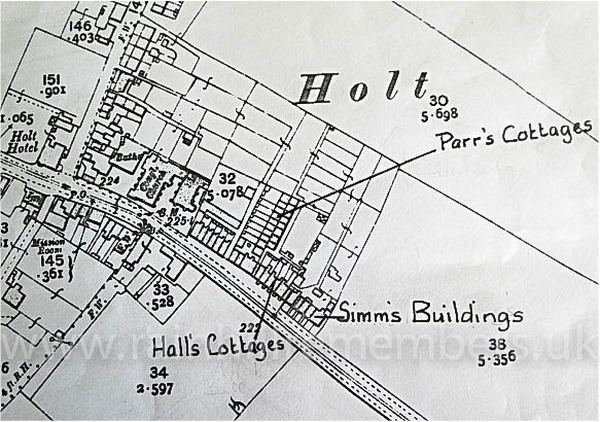 Clifton was born in Simm's cottages, sometimes known as Simm's Buildings at The Holt, Rainhill. These were the last houses on that side of what is now Warrington Road before the fields that stretched to Ivy Farm and Rainhill.